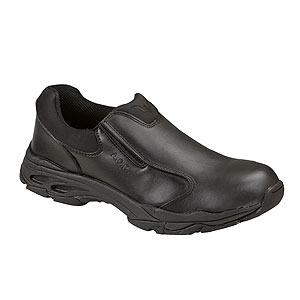 Thorogood Unisex Slip on Athletic Shoe | 500511, THOROGOOD, Thorogood Unisex Slip on Athletic Shoe | McDonald Uniforms, Inc.
Moisture-wicking lining helps keep feet sweat-free. The material gently pulls wetness away from skin, keeping you dryer even when you're working. Thefootbeds are made with a removable design for easy clean-up and odor management. Made with shock-resistant polyurethane, the insoles gently cushion and absorb impact. Athletic Unisex Black Slip-On Shoes are made to be worn by anybody. 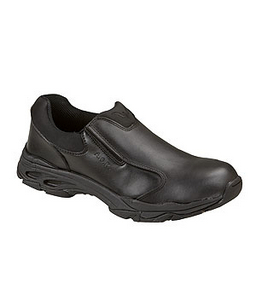 Well, anybody who wants easy comfort and classic style that'stough enough for the workplace. Do you qualify? Moisture-wicking lining helps keep feet sweat-free.